We’re growing some herbs in our little garden and the sage plant is threatening to strangle the poor parsley and thyme bush so we decided we ought to use some up. After the excesses of last week (particularly eating the cuisine of two different countries in one day), we were both in the mood for something simple and fairly plain. 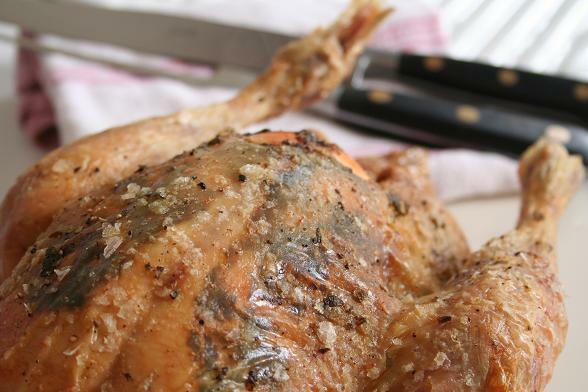 It’s Sunday and it’s raining (again) which really only left us with one option: roast chicken. We’ve not had this for a while so were both excited, particularly as we decided to try a new chicken, a Duchy Original organic chicken since we’ve been rather disappointed with the Sainsbury’s “Taste the Difference” offerings lately. The chicken turned out well; liberally seasoned with sea-salt and pepper, loosely stuffed with garlic, lemon and sage with more sagey butter stuffed under the skin. The aromatics leant a herby note without taking over the flavour of the chicken itself. What didn’t turn out so well was the accompanying roast potatoes, I’m not sure if this was our fault for choosing the wrong variety or whether potatoes just aren’t any good at the moment (we’ve had a lot of disappointing ones recently) but they were incredibly sweet and didn’t crisp up at all. The sagey breadcrumb stuffing wasn’t a bad replacement though and the leeks and curly kale helped to soak up the delicious gravy (this chicken came with the giblets inside which we roasted in the chicken dish with some carrots, celery and onion to give us a tasty base for the gravy). Subscribe to comments with RSS	or TrackBack to 'Sagey Roast Chicken'. goodshoeday’s last blog post..Eating Eurovision: Part 2 Russia – bring on the blini…..
Hi goodshoeday, we just got the Duchy chicken from Sainsbury’s. Sounds like a delicious chicken. I’m doing a similar thing tonight to try and cut down on the sage in our garden. I’m impressed you made giblet gravy. The giblets always come with the chickens we get, but I’m too scared of them to use them. I make hubby taken them out and put them straight in the bin. That chicken looks delicious. It’s always disappointing when roast potatoes don’t turn out the way you’d like, because I think they are the star of any roast dinner! I’m with Jules – I don’t use the giblets and in fact, some of the chickens I buy don’t actually come with the giblets! The giblets made such a difference to the gravy, Jules. Well worth giving it a try if you can. Our chickens don’t normally come with the giblets either, Katie, I’m glad this one did though. We’ll definitely buy this brand again. Since you used garden sage, you should enter this in the “Grow Your Own” roundup. That’s some lovely looking chicken. What kind of sea salt did you use? Organic chicken?! We will really like to get our hands on one but if it is still just too costly at the moment. I hate it when the potatoes don’t crisp up!